Duquesne contributes hundreds of thousands of service hours each year. Administrators, faculty and staff keep Duquesne's spirit of service alive and well on campus and in the community. 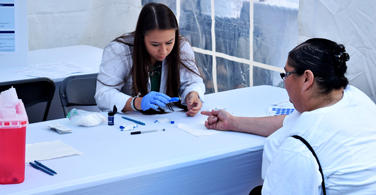 Students, faculty and staff travel the world to care for underserved populations. Students can participate in service related to their majors. Duquesne's student-athletes are active in our local and global communities. 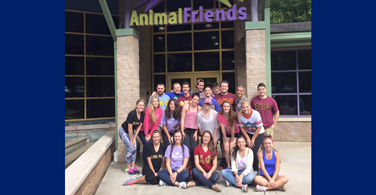 Service is a key part of Greek Life at Duquesne. Here on our Bluff, caring about the community unites us. Service is at the core of our Spiritan legacy and one of the many ways we engage in the community right here in Pittsburgh and around the world. 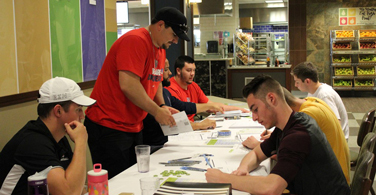 Each year, about 8,000 Duquesne students, faculty and staff participate in volunteer activities, making service to others an important part of our campus culture. In fact, for the sixth consecutive year, Duquesne has been named to the President's Higher Education Community Service Honor Roll in recognition of the University's commitment to volunteering and civic engagement. Students' service experiences provide them with a new perspective and make an impact in others' lives. Whatever your interest, you’re sure to find a fit with our variety of service opportunities and organizations. Our world-class faculty and staff lead by example, sharing their time, talent and more in support of the United Way and organizations like the University Women's Guild and Women's Advisory Board.